Loved these chairs so much I had to purchase more. They really add class to our Dining set. Add extra seating to your existing dining set with these elegantChristopher Knight Home dining chairs. With versatile off-whitefabric, this pair of chairs features high backs with button tuftingfor timeless sophistication. Sleek, espresso-finished legs add tothe chairs' good looks. Made from hardwood for strength and durability, these chairspromise years of use. The armless design ensures a full range ofupper body movement, while the high back and padded seat offeroutstanding comfort that invites your guests to sit back and enjoya long evening of conversation over a meal. I purchased 3 sets of these chairs and love them. I haven't had them very long(2 months to the date of this post) but so far they are holding up fine. I am a 6' tall 225lbs male and my life partner is also 6' 212lbs and the chairs feel very sturdy and comfortable for us. The fabric is beautiful and the tufting looks great. I couldn't bring myself to buy chairs for $$$/each from the store where I bought my dining room table, but I still wanted chairs that were elegant and appropriate for entertaining. I loved the tufted backs, the crown detail, and the neutral color. The height of the chair and width of the seat nearly exactly matched the size of the chairs I considered buying for five times as much. The seat of the chair is nice and wide, and the cushion is thick, not at all cheap feeling. The espresso legs are very dark, nearly black. My only complaint with these chairs is that two of them were damaged/defective- one was wobbly and the other had splintered wood. Customer service was AMAZING. They reshipped me new chairs immediately (I got them in a few days), and returning the bad chairs was as easy as dropping the box off at the UPS store down the street. While it is annoying to have some defective product shipped to you, the response to fix them was so good I couldn't stay irritated for long. Plus, the condition of the other six chairs (and two replacement chairs) was great. I would definitely recommend these to anyone looking for a parson's chair with extra personality. I'm so happy with these chairs. The color is great and just as described. The chairs look expensive and the fabric is great. I orders these chairs to go with a pottery barn table that the chairs I originally wanted from PB cost over $! @#$% for four chairs plus with tax ad shipped would have cost $!@#$#. These chairs from overstock for 1/2 the price look just as good or better. They shipped very fast (4 days) and putting them together was very simple. they look great in my kitchen and I would recommend them. The only down side that I found so far is that the legs are almost black and I was hoping for a dark brown, but it's a minor thing when the rest of the chairs are so beautiful. Perfect and the price can't be beat! 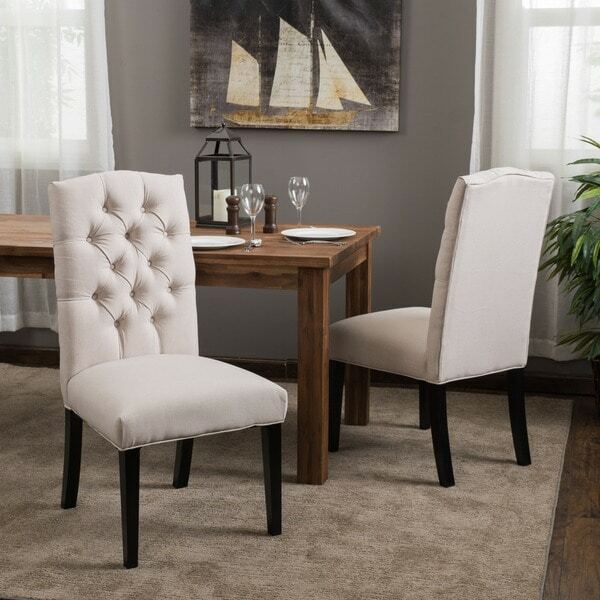 I searched high and low for tufted light colored chairs for my dining room vision. These were by far the least expensive ones that I could find (I bought 8), but that doesn't mean that they are cheap. In fact, they seem like a better quality than what I found for $300/ea at a major department store's furniture department. I'm extremely happy with these, and they fit my vision perfectly. They did take some time to put together, though not hard. The instructions, front legs, and hardware are all stored beneath the chair seat behind the Velcro flap. These do have a linen look and feel, so not a true off white, but definitely light linen. I'll be adding some nickel brad nail head trim but they would be just fine without. Can easily be dressed up or down depending on style preference and where they're used. Super happy with the product - super happy with the price! I need chairs that were the same height as my existing dining chairs. I'm using these as head chairs and they look good with the existing ones. Chairs are better than I expected! I ordered 6 chairs, assembled the 1st 2 and loved them. Went to assemble the next 2 and they were a completely different color of fabric and the wood legs were not the same color as the 1st 2 chairs. I opened the 3rd box and had the same problem not matching. I called customer service and they sent 4 more chairs right away. They came and I assembled all 4 of these chairs(they all matched) but were slightly off color from the 1st 2 chairs. I eneded up sending all original 6 chairs back and prayed that the next 2 would match my other 4 chairs. I just got them today and they are still slightly lighter than the other 4 but I am going to make it work because I am tired of sending items back. Overall I love the chairs and am excited how they look in my dining room. Only gave it 4 stars because of all the hassle, but impressed that customer service handled it so quickly. Gorgeous! Very sturdy and comfortable too. After searching high and low for nice quality chairs at a competitive price, I came across these on Overstock. I was looking for something to go with my farmhouse dining table that was nice looking but not too fancy. After reading all the great reviews, I decided to go for it and order them. I was not disappointed in the least! These chairs are beautiful and very sturdy. The fabric is an oatmeal color and the legs are a very dark brown stain, almost black. The backs are taller than the average chair which makes it look more upscale, especially the button tufting. The seats are wide and deep which makes it very comfortable to sit and enjoy family meals. I received my order within three days and they were packaged very well...even the packaging was on the high end. So just order these! You won't regret it! These chairs arrived in great condition. I was very impressed with how the back and seats were packed with individual drawstring covers to protect the light colored linen fabric. This is something you just don't see in furniture at this price point! The fabric and detailing are high quality linen, not linen look. They are an incredible buy at this price point, especially if you have looked at any of the popular home decor catalogs and see how other linen chairs are priced. Highly recommended. I am ordering another pair. The seat and back cushions are firm but not uncomfortable. They don't feel cheap when sitting on them. The color is as described, definitely "off-white" so they are kind of plain looking. I used these as side chairs along with some similar high back hostess chairs. They all work well together. We have a dining table that we got a great deal on but hated the chairs that were part of the set. Was a little leery buying them online without having seen them in person but am so glad that I did. The chairs are beautiful and look like the quality of chairs that are 3x the price. Material was great and construction was sturdy. Would definitely recommend! Gorgeous chairs, sturdy and easy to put together and we have received so many compliments. They go with everything and all types of decor. Do not hesitate if you are considering buying! Chairs look better in person then they do online. Very elegant looking and they go great with our dining room table. Make sure you scotch guard them because they are very light. Easy assembly. Overall, fabulous buy for the quality and the price. Be aware that the legs are black and don't feel like solid wood. Some of the chairs are not completely even and rock a little bit but I am sure I can fix that with some tweeking. I do think it is a great product for the price. You can't beat the price...I tried! Great chairs if the legs are correct. These chairs are decent and solid, the only issue is that I ordered three sets (6 total) and three chairs ended up having one leg that was a good 1/2 inch off, so they wobbled. The good news is that Overstock replaced said bad chairs, they even offered to just send a new leg, but the legs were the same length, the issue was that the holes were drilled in different places. These chairs are a pain to put together so the thought of having to do it over and over again until you find the magical one chair in two that is constructed properly is annoying. Kudos to Overstock for offering to fix the issue pronto, but it's a lot of work. The only other alternative is to get a more expensive, less stylish looking chair (and these chairs do look GOOD). They look so good that I was going to have slip covers made but I don't want to cover them up. Would recommend to a friend with a warning. These chairs are so awesome that I swore my husband to secrecy, not to tell anyone they came from Overstock. People will think we spent a fortune on them! Now I want to order more but they are out of stock---waiting for a backorder. Very easy to assemble. Comfortable. Added a very high end look to our dining room! If I can talk my husband into knocking out a wall between the kitchen and dining room, I'll be buying more! Bought four of these chairs for our dining room. Absolutely love them! Perfect neutral color for our home. Very comfortable to sit on. Not hard to put together and arrived two days after ordering. Was my first purchase from Overstock and am so pleased. Will definitely be ordering again. We've had these chairs for years, they have survived two toddler boys and multiple dinners and parties. They have held up great and most stains do come off. Could not be beat for the price. Absolutely love these chairs! I purchased eight of them for our formal dining room. They are exactly the way they were described. They are sturdy and comfy. The color is light so if you are going to use them a lot they might get dirty fasts. We have them in our formal dining room so they work perfect. I have had them for three years now and they are still like new and just as stylish as when I Bought them. We've had these for over 4 years and they have held up well. Comfortable and have held up well over 2 house moves. We've paired it with a long harvest table from world market. Average chair. Sinks in when using so it is too short for my table height. I love these chairs. The legs are black, i do wish they were brown but i knew they were black when i bought them. They are very elegant and they look great in the room. Bought 4 of these to go with my dining table (dark wood) and it looks great. the only thing I dislike is the seat is so soft you sink down and since I'm not a tall person and the chair legs aren't that high.... I sit lower than I like at my own table. Chairs looked good but a little wobble. Get what u pay for, but seen more expensive ones at Pier One that were not as nice. "Does the back of the seat taper?" The back is slightly curved, and even more slightly tapered at the top. "One of the legs of one of my chairs broke. How do I order a new one?" We do not sell this as a single seat. "What is the actual color of these chairs?" The chair is an off-white linen color. We also recommend reading customer reviews for a firsthand account of the chair. "Are these heavy chairs? I am looking for heavy real wood chairs." Each chair weighs approximately 25 pounds. These chairs are not exceptionally heavy. Easy to assemble. Color is a beige or light wheat natural linen. Not a off white cream. My chair legs were a very dark espresso brown. Legs may look black to someone. Seat cushion is very comfortable. The crown top shape of chair is stylish. I brought 6 chairs 2 at a time. However they are very popular and in and out of stock quite a bit. All issues resolved immediately . Like 2 left legs instead of a right and left. Another set of legs sent right away. Chairs have supported weights up to 300 lbs. I am very pleased with my purchases. "When will these be back in stock? And can you email me when they are?" Hello brittanylexi, items are restocked as they become available; however, we cannot guarantee an item will be restocked. Thank you for shopping with us. "hey will the legs of these chairs match the dinning table i bought of ITEM# 16557328.let me know. thanks"
Hello shopper, these dining chairs are a great match for that dining table. Thank you for shopping with us! "Do these chairs come in black? I love the look and dimension of these chairs, but I need them in black."